Chasing Epic adventure travel company aims to raise the bar and set new standards in the mountain biking world. BOULDER, CO – Steve Mokan is looking to change the way mountain bikers experience the best trails in the Western US. 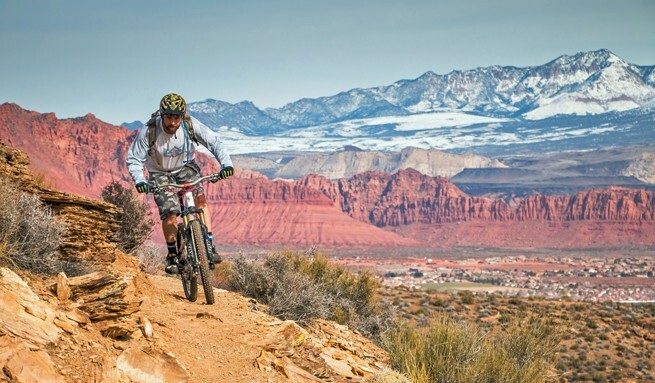 The result is the recent launch of his new mountain bike tour company, Chasing Epic, which aims to raise the bar and set new standards in the mountain biking world. The focus is to offer intermediate and experienced riders fully all-inclusive, locally guided mountain bike trips where those in-the-know most want to bike — the American West – and when everybody has the time – over long weekends. Guests just need to be reasonably experienced and pack a helmet, shoes and appetite for epic single track adventure. Mokan, a long-time Colorado mountain biker and a veteran of the adventure sports world, has worked with adventure travel companies, outdoor gear manufacturers, and ski resorts across the West as a professional photographer with his other venture, Switchback Photography. Over a 10-year commercial journey he saw a glaring hole in the present mountain bike adventure travel industry. Chasing Epic’s adventures include inn and hotel lodging (never camping), hearty meals, high-end demo bikes (an all-carbon demo bike fleet includes Ibis Mojo HD3s, Ibis Ripley LS 29ers, and Niner Jet 9 29ers), local guides conversant with the terrain, customized eight-week pre-trip training programs, best-in-class ride nutrition, shuttles and lift tickets, gratuities and a dedicated on-site trip leader to help control gear mashers and share the stories and laughs with a group of like-minded riders. The destinations for these adventures are, in Colorado; Crested Butte, Durango, Fruita and Telluride, in Arizona; Sedona, and in Utah; Park City and St. George. Unlike traditional point-A-to-point-B mountain bike tour companies, Chasing Epic stays in a single town in each destination and dedicates itineraries to daily rides that cover a variety of the most epic singletrack trails (known and unknown) in each area. “This is possible by working with local guides who have been riding and building trails in these destinations for decades. Each itinerary is unique, you’ll never ride the same set of trails twice with us. We also make sure we’re hitting these locations at the best time of the year: the Desert Southwest in the spring, Crested Butte and Park City in July (wildflowers), and the mountain towns in the fall for the changing aspens,” he underscores. On pre-set scheduled trips the per person rates are $950 for three days and $1,250 for four days, regardless of location. For private, exclusive customized trips the per person rate is $1,150 for three days and $1,450 for four days based on a group of six or more. On the premise that “the less you suffer on the climbs, the more you’ll enjoy the descents,” Mokan has engaged coaching platform companies Training Peaks and Through the Wall Training to customize individualized training programs (valued at up to $400) for eight weeks prior to departure. Contact Chasing Epic at http://chasingepicmtb.com/ or email steve@chasingepicmtb.com or telephone 303.949.3933.